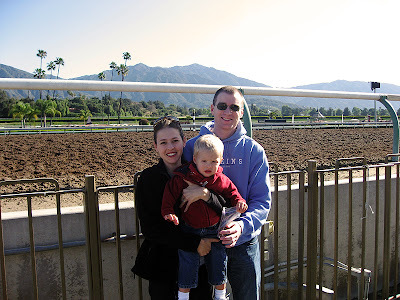 There is a trackside, open-air café called Clockers' Corner at the Santa Anita Racetrack where you can go and have breakfast yards away from where the horses are training, mingle amongst world-famous horse trainers (Ryan recognized Bob Baffert there), jockeys, and owners as their horses go through their morning workouts. Ryan, Dylan, and I got up extra early yesterday and met a few friends there for breakfast. Dylan ooohed and ahhhhed over the big horses galloping by. It was just as you'd imagine Southern California to be like: Palm trees and lush green grass, mountains arching up behind the track through the treeline, clusters of middle-aged rich guys smoking their cigars, watching the horses from time to time while drinking their coffee and reading the paper. And to be honest, I'm feeling homesick for our horses. Growing up my family had two horses (Melody and Joy). They are now semi-retired and enjoying life up in Oregon on the coast. And so I haven't seen them for a couple years now. Being around horses again made my heart ache to ride again. To breathe in the dusty mane of my Melody. To run my hands along her nose. To feel her legs gallop underneath us as we ride. And so our morning out at the racetrack was bitter-sweet for me. Horses were such a big part of my youth and young adult life. If I could have a piece of that again, I would. Maybe someday. But for now I'm glad to have a new memory with my family. Introducing Dylan the wonder of horses with the power and gracefulness of their movements. And I'm so glad that he ooohed and ahhhed alongside my own heart. Oooh, love Santa Anita. Didn't get to go there much though. I saw Bill Shoemaker at Del Mar once though. My ex is a horse trainer. His dad has a training facility in S. Cal. also. We spent some time in the area. I miss the horses a lot (him too really).